Vastu is India's version of feng shui (or is feng shui China's version of vastu?). Anyway, vastu shastra goes by several names, including Vedic architecture, Sthapatya Ved and vastu vidya. But vastu shastra has one goal: to create buildings in harmony with Nature. This will lead to more happiness, but can only be done with the help of numerology and astrology. One must understand all the planetary influences and numerological connections to the Cosmos in order to have harmony in rooms like the kitchen. If things are done properly, "the meals get cooked better, assimilation improves and frittering of energy gets checked. "* Different qualities of energy are dispersed by different things at different times and if one is not attuned to these changes, one will be out of tune. If your house is not aligned properly, you could get sick. I am fortunate I live in a house whose entrance faces east. Many people in my neighborhood, whose houses face west or south, are more likely to suffer such things as poverty, negativity, lack of success, disease, and of course, anger at being so poor, sick and unsuccessful. One cannot deny that a poorly designed workspace, kitchen, bathroom or bedroom can cause a lot of stress, but one will search in vain for the scientific evidence that one's kitchen must be in harmony with moon energies or that sickness will befall you if your entrance faces west. Was it vastu or feng shui that inspired Danish architect Jørn Utzon's design of the Sydney opera house? The people who gave America Transcendental Meditation® and Ayurvedic medicine are also responsible for giving us vastu: the people of the Maharishi. They are fond of making such unsubstantiated claims as that brain physiology is significantly different when one faces east because neurons fire differently in the thalamus when facing east. * They claim that if we could only build one billion new houses in the proper fashion, we could all live invincibly and in peace and harmony with each other and the universe. They make many claims about the Natural Law (no relation to scientific laws of nature, as far as I can tell), Cosmic Consciousness, the Maharishi effect, yogic flying, mantra chanting,direct links of planets to brain parts, etc. None of these claims have any scientific basis. However, simply because vastu shastra--this "holistic design system"--is another bogus philosophy of nature and energy, does not mean that people who claim to be Vedic designers can't produce beautiful and comfortable living quarters. They can, but you don't need a Vedic astrologer to tell you where the sun rises and sets, or what clutter looks like. But apparently you do need an astrologer to tell you that negative energy comes from the West and there must be many windows in the East to make for a happy home and a prosperous business. 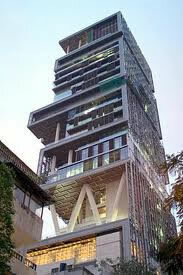 new NYT: Is vastu shastra stalling Mukesh Ambani move to Antilia? Pyramid power used to stop road accidents Vastu expert Sushil Fatehpuria, who offered his services free of charge, said that each 30 centimeter tall pyramid will have a copper bottom and five smaller pyramids inside. "I think the accidents are caused by negative energies. So we need to minimize or convert the negative energy into positive ones," he said. "I will energize the pyramids. I will transfer my positive thoughts into the pyramids." I'm sure Sushil will keep meticulous records to empirically verify his claims. Yes, and pigs do fly sometimes.